As an avid food truck lovers and one of us previously being fully fledged vegetarian, The Lobos Truck was Lili's first food truck experience back into the meat eating world. The first impression I got from the truck was the friendly staff and especially the warm and outgoing chef who goes by the name of Queso. I must say a person whose nickname is that of a food, almost always has a positive correlation with the taste and quality of their product. When we were served our food it was a pleasant surprise to see that we got full portions of their menu items instead of small tastings that food blog writers are used to. Lili: The first item I decided to give my attention to was their vegetarian burger call the Portlander. It had your basic burger fixings with fresh tomato slices, romaine lettuce and caramelized onions curled beneath a warm layer of melted cheese. The bun itself looked and tasted like it came out of the oven that very day. It didn’t crumble or get soggy but provided a great medium to the crunch and juiciness that it was wrapped around. To give the burger that extra stand-out quality was a thin crispy cracker of fried cheese that gave a rich flavor along with an added light crunch. The vegetarian patty itself was of high quality and this is coming from someone who has had their fair share of all different varieties of vegetarian burgers. It was thick and proportioned well to the bun and had hearty chunks of black beans and corn with a subtle hint of chipotle spices that crept in towards the end of each bite. It was amazing how they made their veggie patty resemble the taste of meat so efficiently, it could make any vegetarian feel almost guilty for eating it. Ashley: This was one meaty burger. 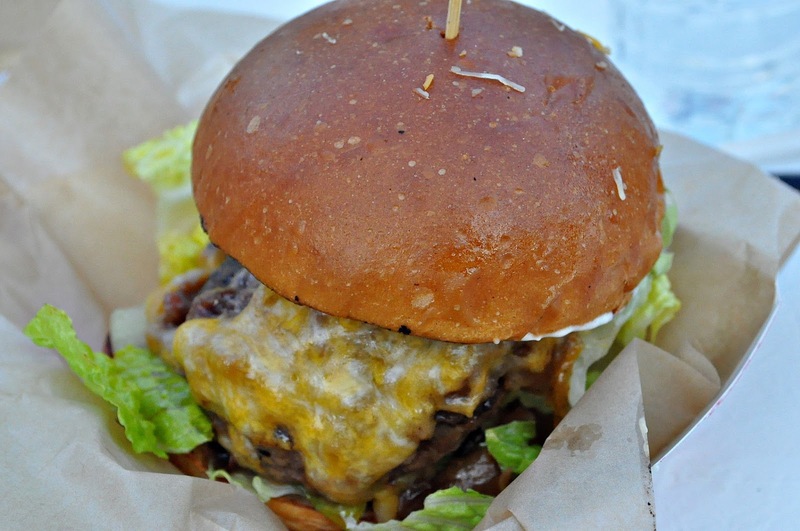 Oozing with white cheddar and packed full of flavor, The Chinook was a burger to remember. My first bite had be grabbing for a handful of napkins because of all the Chinook's juicy goodness. Between the crisp lettuce, perfectly cooked patty, salty cheese and creamy garlic aioli, this burger had an incredible balance of flavors all nestled between a fluffy bun. As a bit of a burger connoisseur I'm pretty particular about my burgers but this one definitely didn't disappoint. 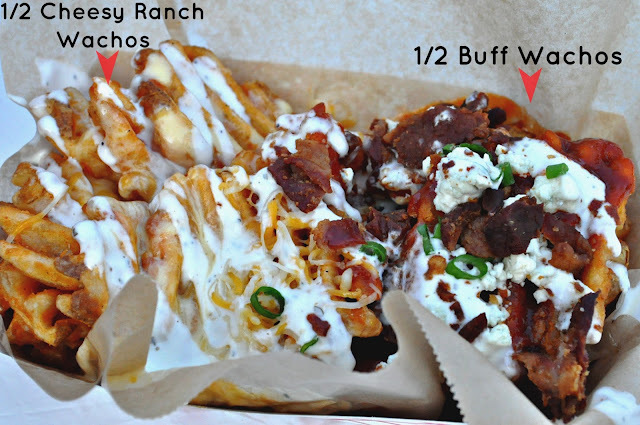 Lili: As with any accompaniment to a burger, I naturally went to taste their Buffalo Wachos. These seasoned waffle fries were covered in buffalo sauce, crispy bacon and sizable chunks of fresh blue cheese. It was the perfect buffalo wings taste all summed up in a side of fries. Each bite had incredible amounts of tang due to the generous amounts of sauce and big pieces of slightly melted blue cheese. To offset any potential sogginess in the fries due to the buffalo sauce, the crispy bacon was there to save the day with a crunchy smoky flavor that won’t easily be forgotten. The chef did an amazing job creating a side of fries that didn’t outshine any of his burger menu items but complimented them and created the perfect balance of comfort and gourmet dishes. Ashley: Cheesy. Ranch. Wachos. There is nothing about those words that I don't like. Waffle cut fries topped with melty cheese and smothered in a creamy tangy ranch...like nachos but with waffle fries, aka Wachos! These definitely reminded me of Irish Nachos, especially when I nabbed some of the bacon and green onion on Lili's side of the fries. The best part was finding some liquid gold at the bottom of the fry boat. I don't know if the cheese melted into the ranch to become a cheesy sauce or if there was a cheese sauce in addition to all the cheese already on the fries, either way, it was a very delicious surprise. Lili: The ribs. The barbeque smothered ribs. Words do not come easy in describing the religious experience I had with this plate. It had been years since I had actual ribs so I was hoping being re-united with them would influence me to keep them in my life permanently. The best way I can describe the taste was meaty deliciousness. Simple as that. Warning: Have plenty of napkins available within your reach because once the ribs reach your lips you will not care that the sauce will take over your face and hands. That being said, you will not have to work for your food, the bone falls right off the meat and not just little wimpy strands of meat but real chunks of thick meat. The barbeque sauce was not spicy or too tangy but was there but provided the meat with a moist blanket of southern style flavor. These ribs were the definition of down home southern cooking that reflected the love and care the chef put into them. Ashley: See the difference in color in those wings up there. TAKE NOTE. This wing assortment is dubbed "Rainbow Wings". A lovely colorful variety of chicken wings ranging in heat from BBQ to Angel to Diablo. The BBQ Wings were fried to a lovely golden brown and were slathered in the same sauce as the Baby Back Ribs and had that same smoky, tangy flavor. The Angel Wings had some heat to them that I can only describe as comparable to your run-of-the-mill hot wings. Then we have the Diablo Wings. The wings that had the most appropriate name. Lili tried it first and ended up coughing herself into tears, to which I replied "Oh-I-eat-sriracha-all-the-time-I-bet-this-isn't-even-hot-you're-just-a-weenie." But then I took a bite. MAN. These suckers were HOT. My first bite was a spicy, vinegary, explosion of flavor...but then the heat came. A mini mouth fire and half a water bottle later and I was ready for bite number two. 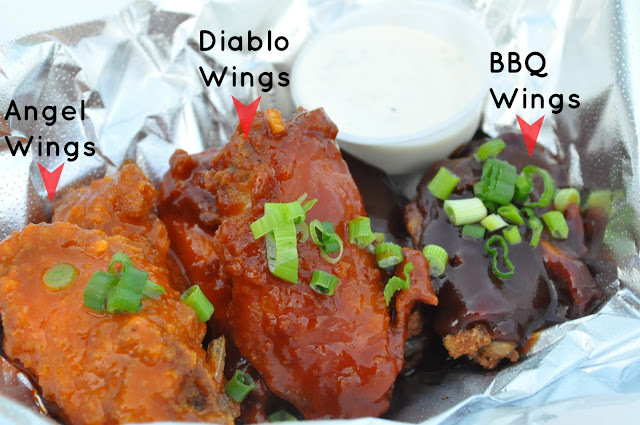 But really, aside from the heat, the Diablo wings were really tasty and highly recommended to you fellow heat seekers. For more information on The Lobos Truck or to check out their menu for yourself, check out their links below! The law of the truck and bus has been exaggerated for the happiness of the individuals. All the sequences have even shaped for the further satisfaction of the users of the instruments and all possible items for the people.